"Heartfelt look at the resilience of the human spirit." "Gyatso is engaging, charming, and riveting his story horrifying." VISIT OUR ONLINE STORE (Educational Copy Available)! "Palden Gyatso's testimony is one of the most extraordinary stories of suffering and endurance". “Gyatso’s unwavering faith in the face of horrific circumstances would make for essential viewing." "If you think you're lost, you're lost. If you think you're a winner, you're a winner. "…said Palden Gyatso, as he was trying to explain to us the secret to his inner strength. "Makoto Sasa did a phenomenal job with this film. 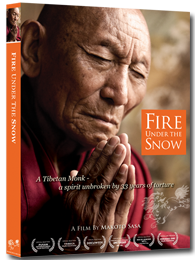 It is intimate in it’s sadness, yet empowering to hear and see Palden Gyatso tell his story. It is a grim and gruesome story at times, but one that had to be told." CLICK HERE TO SEE WHAT PEOPLE SAY ABOUT THE FILM! I am a Tokyo born woman who has been trying to apply Buddhist philosophy to the challenges of hectic everyday life in New York City. One day, I heard an incredible story about a Tibetan Buddhist monk who was a political prisoner for 33 years, but finally escaped. It put the concerns of my small life in the big city into a completely different perspective. A decade later, I was in Dharamsala with my film crew, and I started filming Palden Gyatso. Palden is now 77 years old and lives alone. His kindness and gentle manner are not some Tantric magic, but spring from simple, daily Buddhist practice cultivated over a lifetime. In our conversations, he was very humble regarding his own story, seeming almost removed from the events at times. However, reminiscences about friends starved or tortured to death, driven to suicide or still in prison, caused him to break down into heart-rending sobs: this is a legacy of pain beyond pain. Today, open international support of Tibet is declining in the face of a gold rush into the ascendant Chinese economy. World leaders do not feel they can "afford" to challenge Beijing on the basis of human rights, for fear of incurring economic retaliation. However, Palden Gyatso's life story transcends notions of religion or political movements, and speaks to our entire earthbound condition. He accommodated suffering, but did not capitulate to it; this is not only his triumph, it is a story that needs re-telling in every generation. The pain and war of our own times and minds make this all the more evident. I passionately believe that this film will bring some small measure of hope to those touched by it. and WATCH "Making of Fire Under the Snow"! *Our DVDs are offered in either NTSC or PAL formats. When purchasing, please select the format based on where you live. *comes with 10 DVDs that pays for itself! *You can sell the 10 extra DVDs for $24 each at the event, so the kit pays for itself and helps you raise $100 for your organization! *You can sell the 20 extra DVDs for $24 each at the event, so the kit pays for itself and helps you raise $200 for your organization!